1. Bring a large pot of generously salted water to a boil. While it heats, trim the root end of the garlic; if it has a stem, cut it 4 inches from the bulb, then slice the bulb and stem in half lengthwise. Remove any tough outer skin. 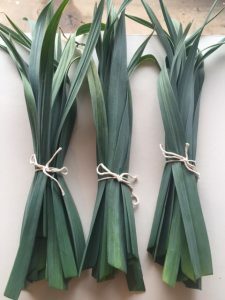 Lay each half cut-side-down and slice as thinly as possible (if using garlic scapes, also slice as thinly as possible). Gather up the garlic in a bowl, season with coarse salt and work the salt into the sliced garlic using your fingers. Your fingers will smell of garlic — yes! — and it’s a nice spring-like aroma. Let sit for at least 10 minutes. 2. When the water boils, add the asparagus and cook for 2 minutes. Drain and plunge into a bowl of ice water to stop the cooking. Drain and dry the asparagus spears, then cut thinly (1/4-inch) on the bias. Arrange the asparagus on a platter (or individual plates). Sprinkle the garlic over the asparagus. Drizzle some oil over the asparagus — it’s ok if it pools a little, especially if it’s good oil. Using a vegetable peeler, scrape away about 1 inch of the horseradish skin from the end of the root; give it a rinse. Grate the white root over the asparagus — about 2 teaspoons of horseradish. Season with more salt, if needed, and serve with lemon wedges. 1. To make the tart crust, add both flours and salt to the bowl of a food processor; pulse a few times to combine. Sprinkle butter over top and pulse several times until the largest butter pieces you see are a bit larger than a pea. Pour egg over flour mixture and pulse several times, until clumps begin to form. Turn mixture out onto a work surface. Quickly gather the dough together into a ball, knead it just enough so that you can form it into a 6″ disc. Wrap in plastic and refrigerate for 30 minutes. 2. After 30 minutes, transfer the tart dough to a work surface lightly sprinkled with flour. Roll dough into a 12 inch round; lift and turn the dough often to keep it from sticking. Place your rolling pin over one end of the dough round and roll it up. Unroll the dough over a 9″ tart pan with a removable bottom, doing your best to center it. Gently press dough on bottom and sides of pan (patch any torn or short areas); trim dough to 1/2 inch overhang. Fold overhang to create a double-thick edge and pierce all over with a fork. Cover with plastic wrap and freeze for at least 1/2 an hour, preferably longer (see headnote). 4. For the filling, heat a large skillet over medium heat. Add bacon; cook and stir until fat begins to render, about 3 minutes. Add leeks, green garlic, and a pinch of salt. Cook and stir about 10 minutes more, until leeks and garlic are soft and bacon is cooked through. Set aside. 5. In a medium bowl, whisk together eggs, sour cream, thyme, and pepper. Stir in Gruyere and bacon mixture. Pour into crust and bake at 375 degrees for 15 to 20 minutes, or until set in the center. 6. Remove from oven; transfer to serving platter and garnish with thyme sprigs. Slice into wedges and serve warm or at room temperature. 1. Heat oven to 400° F. On a rimmed baking sheet, toss the bread with the oil and ¼ teaspoon each salt and pepper. Bake, tossing once, until golden, 7 to 9 minutes. Let cool. 2. In a large bowl, whisk together the buttermilk, mayonnaise, parsley, garlic, ½ teaspoon salt, and ¼ teaspoon pepper. Add the lettuce, radishes, shallot, and croutons and toss to coat. 1. Place the radishes in a large skillet and add just enough cold water to cover, about 2 1/2 cups. Add the butter, sugar, salt, and pepper and bring to a boil. 2. Reduce heat to medium-low and simmer until the radishes are tender when pricked with a paring knife and the liquid has reduced to a glaze, about 12 minutes. 3. If the radishes are tender but the liquid hasn’t reduced sufficiently, use a slotted spoon to transfer them to a serving dish and continue reducing the liquid. Spoon it over the radishes and serve with buttered crusty bread. 1. Wash the radishes and cut out any soft or unsightly parts. Do not peel. Trim the ends. 2. Slice the radishes into 1/4 inch (1 cm) rounds. Place them in a widemouthed pint jar. 3. Mix salt into room temperature water until dissolved. If you’re using a mineral-rich rock salt, all of the solids may not dissolve and that’s okay. 4. Pour brine over the radishes, leaving a 1/2 inch or more of headspace. Place a weight in the jar, or use a smaller jar full of water to keep your radishes submerged. You may want to place the weight in the jar over the sink to ensure that an excess brine doesn’t overflow. Make sure that there is a thin layer of water over the top of the radishes, and that there is a little space between the water level and the rim of the jar. If your jar is too full, time to munch a couple raw radish slices to bring it back down to normal. 5. If your selected weight fits in the jar, place the jar lid on top, and secure but don’t tighten it. You want to leave room for the carbonation to escape. If the weight you’re using rises above the rim of the jar, use a clean kitchen cloth secured to the jar with a rubber band to cover. 6. Allow your jar to sit at room temperature for 6 days. Take a taste. If the pickles don’t seem sour enough, re-cover the jar and let them sit for a few more days or as long as 2 weeks total. Once they’re to your liking, remove the weight, secure the jar lid and place the jar in the refrigerator. Enjoy your radish pickles plain or with a dip. 1. Preheat oven to 325°F. Coat baking sheet with cooking spray. 2. 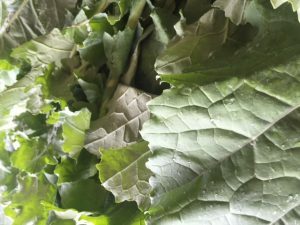 Tear kale into 3-inch pieces, removing tough stems. Transfer leaves to bowl. 3. Toss kale leaves with olive oil in bowl, until well coated. Spread on baking sheet, and bake 15 minutes. 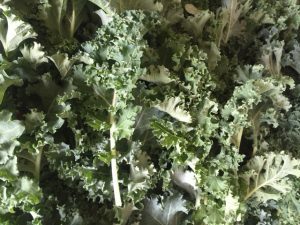 Turn kale with tongs, and bake 10 to 15 minutes more, or until edges are browned and leaves are crispy. Sprinkle with salt. Serve warm or cold. When kale is young and tender, toss a few leaves in your salad bowl. The larger leaves benefit from cooking. For a simple, tasty batch of greens, saute a little bacon with some shallots or onions. When the bacon is mostly cooked, add the kale and stir for a minute. Then add some freshly squeezed cider, if you have it, and steam until done. When cooking Swiss Chard consider using a cast iron skillet. We sauté some onions and garlic in butter first. 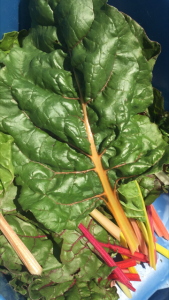 Chop the stalks of the swiss chard into one inch sections and throw them in the skillet. Allow these to cook about 5 minutes prior to introducing the Swiss Chard Leaves. When chopping the leaves, roll them as you would a cigar, then chop into one-inch sections and sauté in the skillet. Season and serve as you would like.